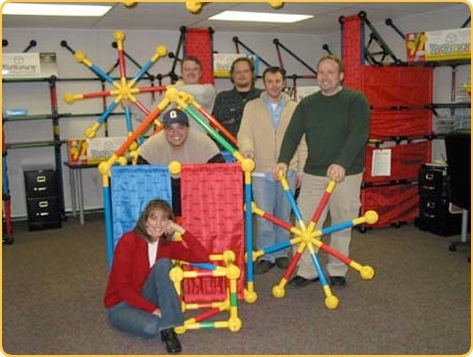 Joe had a vision to create a life-sized building toy for families to play with to help reconnect with each other. It took four years of business planning, market research, manufacturing trips, endless conference calls with engineers, designers and patent attorneys but finally on September 21, 2003, the Toobeez product was born! Toobeez is a life-sized construction building system comprised of interlocking tubes and spheres that can be linked together to create anything imaginable, from a simple cube shape to a complex structure like a lemonade stand, house, airplane or submarine. Just connect, twist and create! Armed with the knowledge that there was more to Toobeez than just a toy, Joe reached out to industry experts and educators with the goal of developing a collection of materials that provide activities, educational tools and lesson plans for use with Toobeez. Among the topics covered: team building, math, language arts, occupational therapy and special needs and senior needs.